An original goal of Rotary is to allow club members to meet periodically and enlarge their circle of business and professional acquaintances. As members of the oldest service club in the world, Rotarians represent a cross section of our communities business owners, executives,managers, political leaders and professional people who make decisions and influence policy. Club members have many opportunities for humanitarian service, both locally and internationally. Service programs address concerns such as health care, hunger, poverty, illiteracy, and environment. Rotarians regularly experience the fulfillment that comes from giving back to the community. Rotary is founded on fellowship, a cornerstone that continues to members today. Rotarians enjoy camaraderie with liked minded professionals, and club projects provide opportunities to develop enduring friendship. Club members who travel have friendly contacts in almost every city of the world. Rotary sponsors some of the world's largest exchange and education programs. Rotary Clubs provide innovative training opportunities and mentoring for young leaders, and they involve family members in a wide range of social and service activities. Encouraging high ethical standards and respect for all worthy vocations is a hallmark of Rotary from its earliest days. In their business and professional lives, Rotarians abide by the Four Way Test of the things we think, say or do. 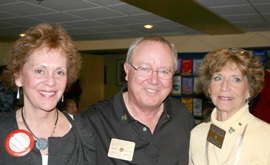 Rotary is an organization of successful professionals. Team building, fundraising, public speaking, and communication are some of the leadership skills that club members can exercise and enhance. Being a Rotary leader provides further experience in motivation.